Can't view this e-mail? See it online. FREE UPGRADES: Our newest way to perk up your Caribbean vacation. Book a veranda stateroom at ocean view rates and turn incredible views into your own private retreat in the Caribbean. Now starting at just $899†*. 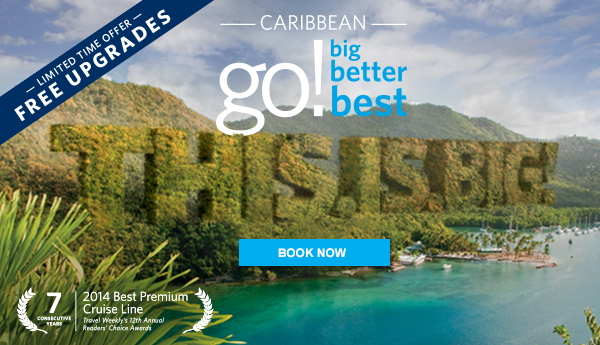 Plus, combine your FREE upgrade with Go Big, Go Better, Go Best, for a Caribbean vacation that's simply PERKfect! all over the world—give us a call. †Taxes, fees, and port expenses of UP TO $104.72 per person are additional and subject to change. * Prices are per person, cruise only, for stateroom category 08, select sailings and based on double occupancy. Veranda for an Ocean View Price Offer "Offer" applies to select Caribbean sailings departing Nov 2015 â€“ Jan. 2016. Book Offer between July 27 â€“ Aug 23, 2015. Applicable sailings listed at celebritycruises.com. Redeem by booking a veranda X stateroom, priced the same as oceanview category 08. This offer is combinable with Go Big, Better, Best Offer. Go Big, Better, Best Offer provides each of the first two guests in an ocean view and above stateroom booking with a complimentary Go Big option, which includes guest's choice of a Classic Beverage Package, Unlimited Internet Package, $150 per person onboard credit ("OBC"), or Prepaid Gratuities. For an additional charge, select the Go Better option and receive a choice of two amenities or the Go Best option and receive all four amenities plus an upgrade to the Premium Beverage Package. Charge varies by option and cruise nights. Prepaid Gratuities option provides prepaid stateroom, waiter, assistant waiter and headwaiter gratuities in the amount suggested by Celebrity's guidelines. OBC is not redeemable for cash and expires on final night of the cruise. Third and higher occupancy guests booked in a triple or higher occupancy stateroom each receive one 40-minute Internet Package and one Classic Non-Alcoholic Beverage Package. Captain's Club Reduced Deposit Offer: Classic members and higher are eligible for a 50% reduced deposit on Qualifying Bookings made more than 70 days from departure date. Reduced deposit must be paid by deposit payment required due date. To redeem at celebritycruises.com, proceed to the payment page, select "Other" in the deposit field and enter 50% off the deposit amount. Celebrity's cancellation policy applies, including but not limited to full cancellation penalty amounts. Valid membership number must be provided at time of booking; new members may book on board without a membership number but must provide the membership number 90 days prior to sail date. Go Big, Go Better, Go Best booking options are applicable to new individual bookings and to staterooms in non-contracted group bookings, non-transferable, applicable only to the Qualifying Booking, not combinable with any other offer. Offers and prices are subject to availability, cancellation and change without notice at any time. Refer to Cruise Ticket Contract for additional terms and conditions. ©%%xtyear%% Celebrity Cruises Inc. Ship's registry: Malta and Ecuador.